The Living Organisation Leadership™ framework allows us to deliver modern, appropriate, inclusive and pragmatic leadership skills to leaders, managers, teams and individuals. 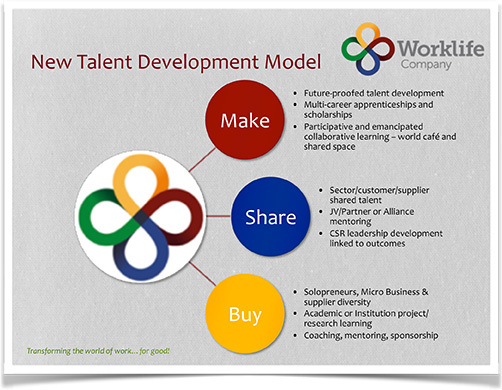 Talent development is changing, and whilst it has evolved from traditional classroom to blended learning, this is L&D strategy focused on the delivery mechanism, i.e. e-learning, workshops or formal qualifications. Now there is a new model emerging that develops and re-invests in the natural resources required by the organisation and its people for long-term sustainability and growth. This model is a ‘make-share-buy’ approach to designing and delivering leadership and employee development, that is linked to cause, direction and values. The medium for delivery can be wide and varied. Our Leadership Development incorporates the key aspects of this new learning framework and develops leaders in a way that aligns them to cause whilst creating tailored personal development. Leadership development is personal development and there are thousands of ways to deliver learning in ways that are appropriate to the learner and the organisation. Behind each season of the Living Organisation™, there are a selection of interventions and opportunities to develop and deliver ‘courses, sources and resources’ of development. We have over 25 years experience in learning and development and all of our team are qualified in personal and professional development. Each of the above is defined in detail as required, and our ideas for innovative learning & development solutions are detailed in line with the Living Organisation™ and VIA Expert frameworks. “Learning and unlearning are two sides of the same coin. It is just as important for all leaders to let go of out-of-date thinking and behaviours, as it is to add to their knowledge, experience and insights”.